A horror-comedy for anyone who hates politics! From the creative team of writer Sam Humphries (Star Lord, Weirdworld) and artist Tommy Patterson (Game of Thrones, Farscape) comes the Faustian farce CITIZEN JACK, collecting the first six issues into trade paperback this August. Every presidential candidate has a skeleton in their closet, but Jack Northworthy worships the devil! A scandal-plagued, small town politician, Jack should in no way be president. But he's got a secret weapon: Marlinspike, a malevolent demon of high ambitions. Together, they're running for president in an outrageous campaign that America will never forget! 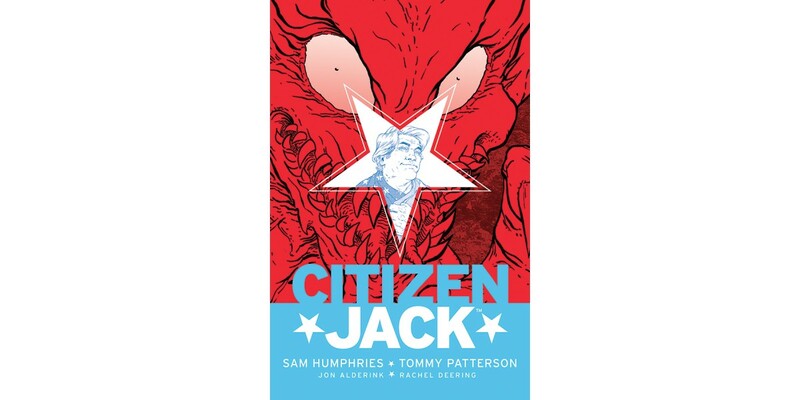 CITIZEN JACK TP (ISBN 978-1-63215-705-8) hits comic book stores Wednesday, August 3rd and bookstores Tuesday, August 9th, and will be available for $14.99. It can be ordered by retailers with Diamond code APR160796, and it is available for preorder on Amazon, Barnes and Noble, Indiebound, and Indigo.